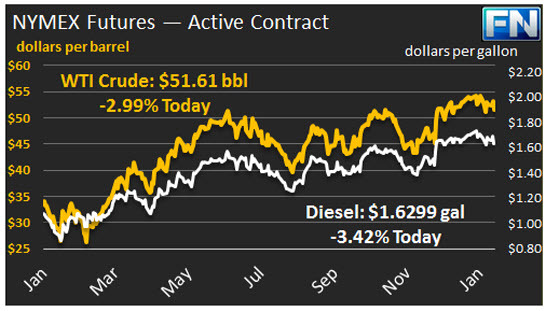 WTI crude prices retreated below $52/b this morning on new concerns over crude supply. WTI opened at $52.52/b today, a drop of just three cents from yesterday’s opening price. Price rallied for a time yesterday, but a sell-off eliminated price gains. 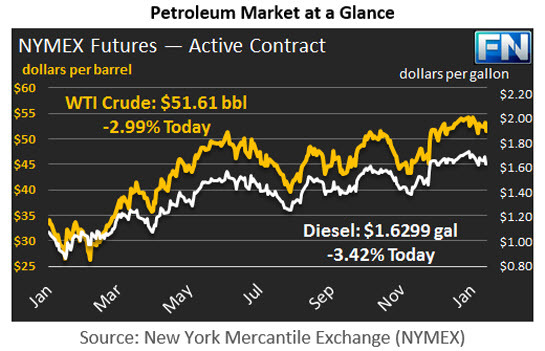 Current prices are $51.61/b, $0.87 below yesterday’s close. The supply concerns focus on the resurgence of U.S. production. The higher prices achieved by the OPEC-11 & NOPEC-11 cuts have encouraged a number of oil rigs back into action, and the impact is beginning to show. Yesterday, the EIA released its estimate that crude production from the seven main shale plays will rise from 4707 kbpd in January 2017 to 4738 kbpd in February 2017, an increase of 41 kbpd. This includes a 53 kbpd increase in the Permian region, which will offset some declines in other areas such as the Bakken, where production is expected to drop by 20 kbpd. Natural gas production from the shale plays will rise from 47,639 million cubic feet per day (mmcf/d) in January to 47,969 mmcf/d in February, an increase of 330 mmcf/d. Most of the increase is expected from the Marcellus play, followed by Permian and Haynesville. Distillate opened at $1.6486/gallon in today’s session. This was 0.4 cents below yesterday’s opening price. Current prices are $1.6299/gallon, down by 1.87 cents from yesterday’s close. RBOB opened at $1.6026/gallon today, down 0.61 cents from yesterday’s opening. Prices slid to $1.5788/gallon today, down 2.16 cents from yesterday’s close. The EIA released its data on U.S. Retail Gasoline and Diesel Prices for the week ended January 16th. Prices for both fuels receded at the national level, though Rocky Mountain and U.S West Coast gasoline prices continued to climb. Details are presented in our second article today.